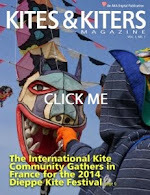 Tako Kichi (Kite Crazy): Chico Kite Day was a winner! Chico Kite Day was a winner! The winds were already above 10 MPH when I got up on Sunday morning. It looked like it could start raining any minute, so I dressed for wet weather. My flying buddy, Jim Stainback, picked me up before 11 AM, and when we arrived at Community Park, we found kites already in the air (Kite Day officially starts at noon). By 11:30 Jim & I had kites up, and friends, Mike Hagen and Rhonda Davidson, had arrived and were unpacking their wagon-full of kites. By about 12:15 we had at least eight kites in the air (surrounded by hundreds more) plus two stuntkites, a TOTL Hawaiian Team Kite and a Widowmaker. Like every Chico Kite Day (except for last year's rain-out), kids and families were in abundance and having a great time. We didn't quite make it to 4 PM; a light rain let loose around 3:30, prompting us to wind it all in. As Kite Days go here in Chico, CA, this one was pretty darn good. The favorable winds were steady, the weather held, hundreds of kites were flown... and there were smiles and laughter all over the park.